Some Bingo Halls just like to keep with a schedule. 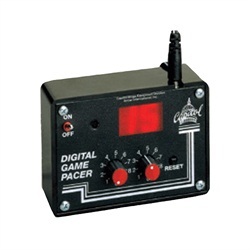 This Game Pacer can help with that. Large LED display to view countdown. 1-99 second adjustable timer. Audible beep to pace game. 120 volt power pack. Make your callers life a little easier. Let the caller focus on the task at hand. With this little guy that becomes possible. It measures 4.75"x5.25"x2.5" and weighs 5.25lbs.